Back in my days as an executive assistant, the last days of the year were a flurry of activity. There were end-of-year events to plan and juggle, client gifts to purchase and send, and vacations to work around and cover. The to-do list never ended. And yet, my best bosses always made time to get around to me toward the end of the year and to check in on the things that would need attention long after the turkey had been eaten, the gifts had been unwrapped, and the ball had dropped to ring in the new year. Those questions always revolved around a central question: Where do we want this business to be at this time next year? It had a huge impact on me that these leaders were, amidst the chaos, thinking ahead in long-term ways. And these were the ones that I saw grow, year after year. Bigger teams, bigger bottom lines. And all because they had the foresight to see what would happen if they thought ahead, and to involve their support staff in the discussions. With that in mind, we wanted to get our clients–current and future–thinking that way, too. Because we believe that if you ask those questions now, the answers will put you in the frame of mind to grow your own business. Here are five questions to sit down and ask both yourself and your team right now. We think if you do, you’ll see major growth in 2019 and beyond. Where have we been struggling? 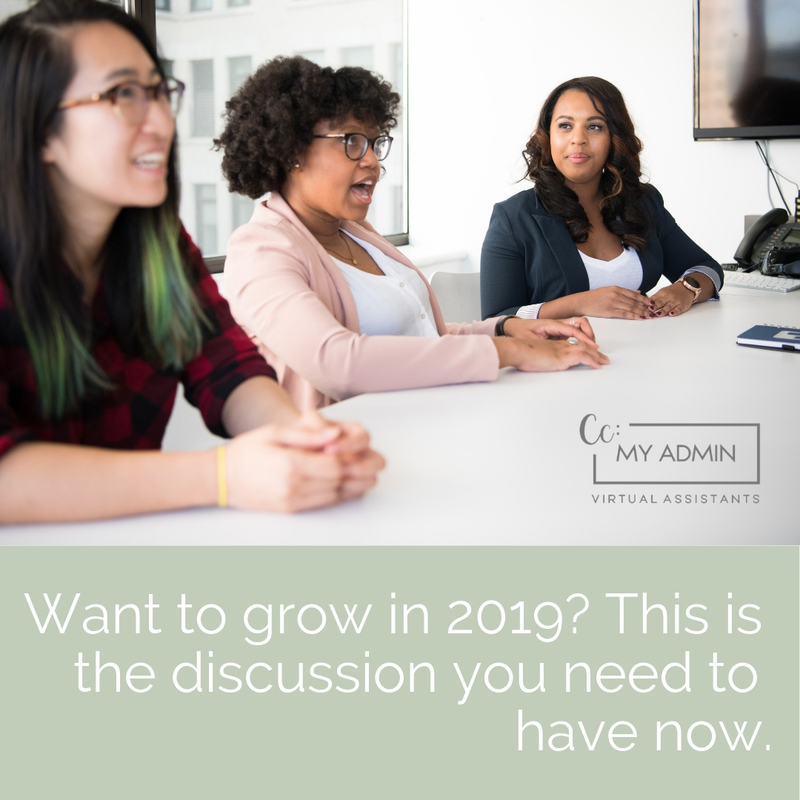 The answer here could range from communication within the team, interaction with clients, customer service issues, financials, a changing culture–particularly if you’ve seen growth this year. If you’re still going at this solo, you need to be very honest about this. And if you have a team, listen to them. They may be able to give you the valuable feedback you hadn’t considered, given the different roles you each play in the team. What would I like my role to look like in a year? As the leader of your team, you may want to become more high-level in your dealings with the business. That’s a great goal to have. It means you’re ready to delegate some things so that you can continue casting the vision for your team and doing the things that only you can do to achieve that vision. Perhaps you want to review the financials–not do them yourself. Maybe you want to get more strategic about meetings with your team. And wouldn’t it be great to get together at set intervals when everyone can focus, rather than just scraping by with on-the-fly check-ins? When you ask this question in conjunction with your team–even if your team is just one virtual assistant, you’ll be able to find out what is really do-able. Is there someone who could grow into a role that would solve those problems? Is there a real pain point that more help would fix? Do you just need accountability to hold those meetings or hold you to the vision you have? What would you like your role to look like in a year? The answers to this question may reveal things you never knew about your team! Is there a team member who could step up their skills and fill a new role? Perhaps they have an interest that, with a bit of training, could fill one of those holes on your team. If you can figure those things out with people you are already working with, the investment may mean a longer-term relationship with that employee, and less time spent training someone new. What’s on my wish list of things the company could be doing? This is probably a big list–we all have big ideas for what our company could/should be doing. But the way you answer this as a team can help you determine the area of focus you want to take. Maybe you have many things you want but you know your staff is specifically skilled in one particular area. That can help you decide if that’s the only place you focus, or if you’ll add a team member who can help you out in a different area. Maybe you want a bigger social media presence or more community exposure. Whatever it is, getting it out in the open helps you see how you might ultimately get there. …And what steps do I need to take to get me to those goals? Speaking it is just part one. Now you get to figure out how to meet those goals? Let’s say you’ve hired a virtual assistant for a few hours a week to answer email and follow up on leads. If so, you may be able to better see how hiring a social media assistant might get you to your goal of a bigger online presence. Likewise, maybe a bookkeeper has freed you up to do more of the work you love. You may then have a better vision of how a virtual admin doing tradition email, phone, and lead answering could advance your business even further. Now you make a plan to get you to the goal, and to put the people in place to get you there. We know you have big ideas and dreams for 2019! Now is the time to get to work on them. Edward Rickenbacker once said, “I can give you a six-word formula for success: Think things through–then follow through.” I”m pretty sure those great bosses of mine were reading–or at least channeling–him when we would all schedule that precious time at the end of the year to have these discussions. If you do the same, 2019 will be huge for you.